Topics: Solutions Crm-xrm, Services, A Propos De Nous, Références, Nous Contacter, & Solutions Métiers. 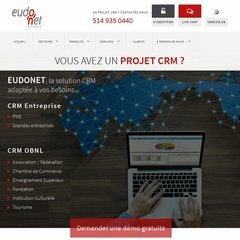 eudonet.ca About Eudonet Canada Inc - Editeur, intégrateur de logiciel CRM ..
eudonet.ca Eudonet Canada Inc. editor, integrator CRM and XRM* software 100% ..
Eudonet (Ile-de-france, Clichy) is the location of the Microsoft-IIS/6 server. Its 2 nameservers are ns76.rapidenet.ca, & ns75.rapidenet.ca. The programming language environment is ASP.NET.